I have won a fair number of nice things on Twitter. Tickets to one of the Cirque shows in town, a UC basketball game, and Skyline Crosstown Shootout paraphernalia. And of course I am always hoping to win one of Scott Bourne’s killer camera give-a-ways (even it it is never Sony Gear). 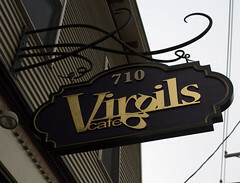 However, the best contest victory, by far, was winning Virgil Cafe’s “be a schlep for a day” contest. Ironically I had no idea what I had won. I re-tweeted the contest because it was a local restaurant on my to-do list, and I wanted to help them spread the word. However, just before Christmas, Matt let me know I had won. I joked about having won a “major award” (a reference Matt got immediately) but little did I know how major it was.